The ID-800H can transmit and receive D-STAR format digital voice and 950 bps data communication, simultaneously. The Digital features of the ID-800H are compatible with IC-2200H, IC-V82 and IC-U82 radios with the optional UT-118 installed. In addition, analog FM mode is also available. When an external GPS receiver (NMEA 0183 format) is connected to the ID-800H, yours and other station’s position information can be exchanged and shown on the display. When the receiving side is connected to a PC*, map plotting is possible. Supported data formats are GLL, GGA, RMC, GSA and VTG sentences. * Map plotting software required (Not supplied by Icom . In the digital voice mode, your callsign and the calling station’s callsign (or CQ message) are included in each transmission. The callsign squelch allows you to choose an incoming call selected by the callsign. Also, received callsigns are automatically stored in the memory. The ID-800H has 55W/50W (VHF/UHF) output. It is Icom’s most powerful dual band mobile. High power for long distance communications plus reduced power settings (15/5W) for local ommunications. 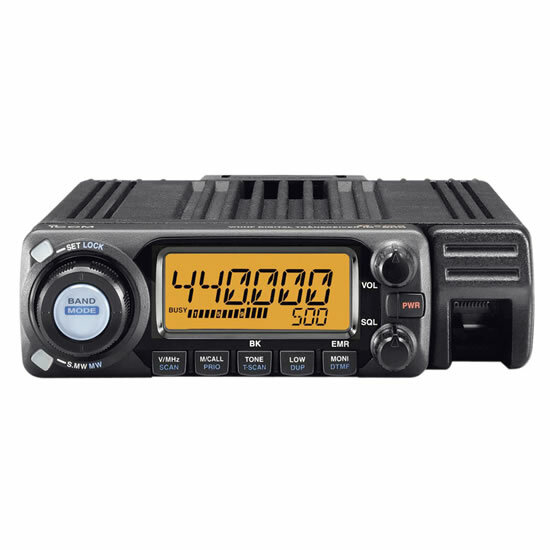 The ID-800H wideband receiver covers 118–173, 230–549 and 810–999MHz* as standard. Listen to your Amateur VHF/UHF bands, as well as aviation, marine, weather and other utility communications in a compact mobile package. * Excluding Cellular range. AM, FM, N-FM mode only. The separation cable, OPC-600/R, is supplied with the radio allowing the compact remote control head* to be installed almost anywhere. With this much memory, you can fill your ID-800H with all of your favorite frequencies and operation settings! Then name each memory channel with up to 6 characters for quick channel identification.